St Leonards Catholic Church is located on the corner of Willoughby Road and Donnelly Road, in the northern suburb of Naremburn. This heritage listed church was designed by J.T. McCarthy and built in 1913 in the Neo-Gothic style. The spire and extension was designed by Allan G. Robertson and built in 1955. 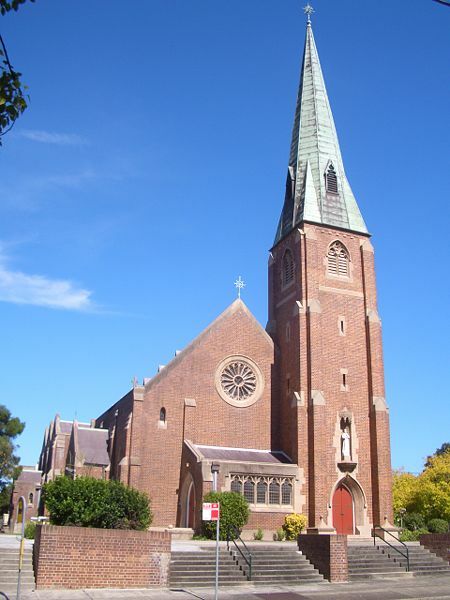 The adjacent suburb of St Leonards, took its name from this church. Linked to: Shadow Shot Sunday, InSPIREd Sunday, Sundays In My City, All Seasons. This one reminds me of a couple here, and one in the countryside not far from where I grew up. I love the subtle shadows on the steps leading to the main entrance. Nice one! Very impressive spire. Never have seen a neo-Gothic style, and it looks surprisingly simplified! Wonder if the roof of the tower is of copper? Jesh, I'd say it is copper which gives it that green patina with age. Beautiful architecture. And what a coincidence - my Mom lives at a senior Catholic community called St. Leonard's!